WELCOME IN 2014! 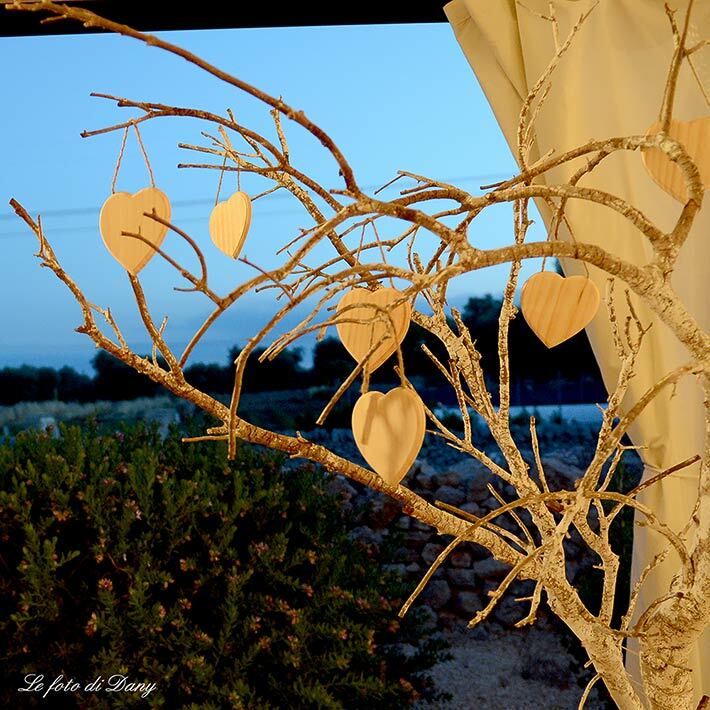 Italian Country Wedding blog has a special gift for all our readers! Our web site and blog was entirely on Piemonte region and its wonderful countryside and still are! We wanted to add a little more. 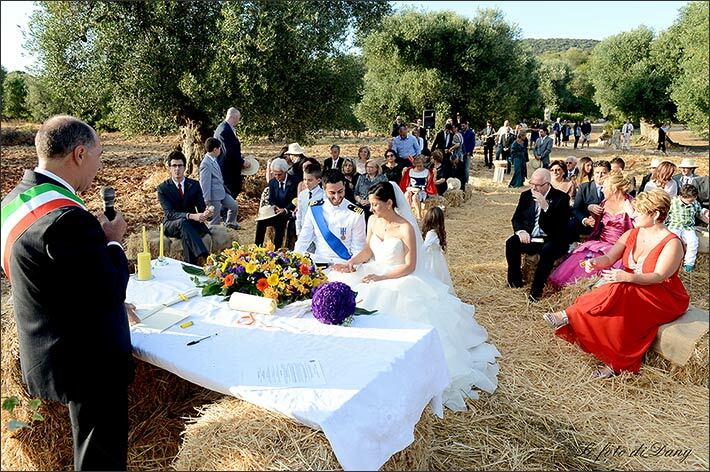 Starting from this month we will host some weddings stories from other regions. It will be just sometimes as an extra token to our readers. We will still tell you about the beautiful Piemonte countryside but we are sure you will appreciate our little digressions on other regions countryside. This month we are hosting Apulia region! Apulia is the heel of Italian “boot”. It is located South-East Italy on Adriatic and Ionian sea. A wonderful Mediterranean landscape, warm and so welcoming. 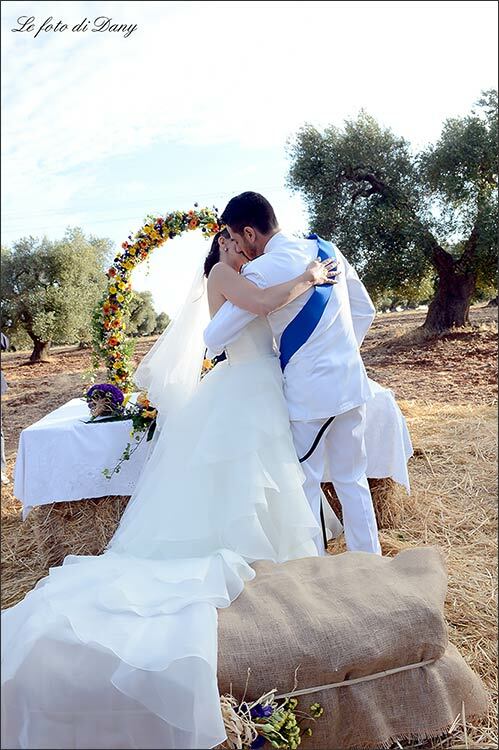 Apulia is a wonderful destination for the ones who are looking for a wedding on the seaside but Apulia offers also wonderful countryside in Murge a vast karst plateau with olives groves and amazing nature. Here is the story we would like to tell you about. 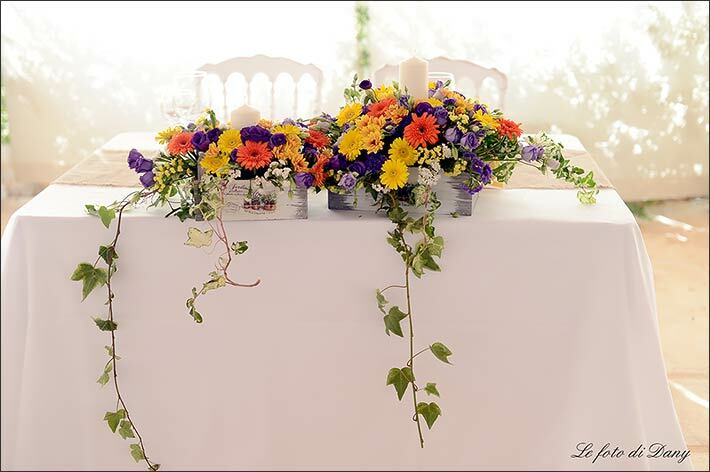 Bride and groom’s passion sometimes can easily become real wedding theme. 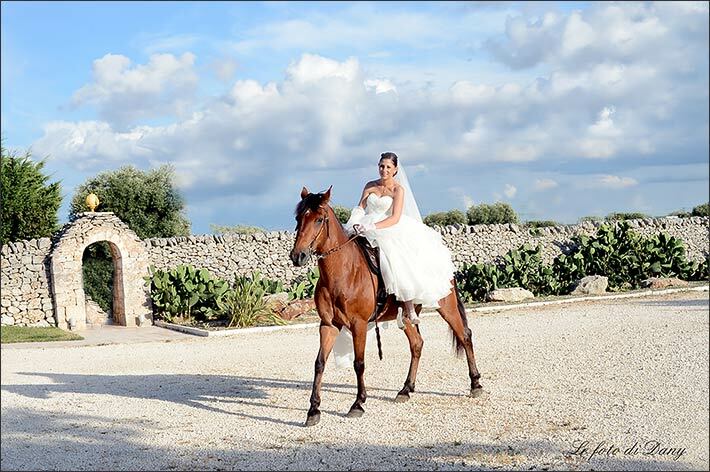 Amazing countryside, natural scents and above of all, a deep love for horses and riding… this was the ideal starting point for Gianluca and Alessia’s wedding theme. 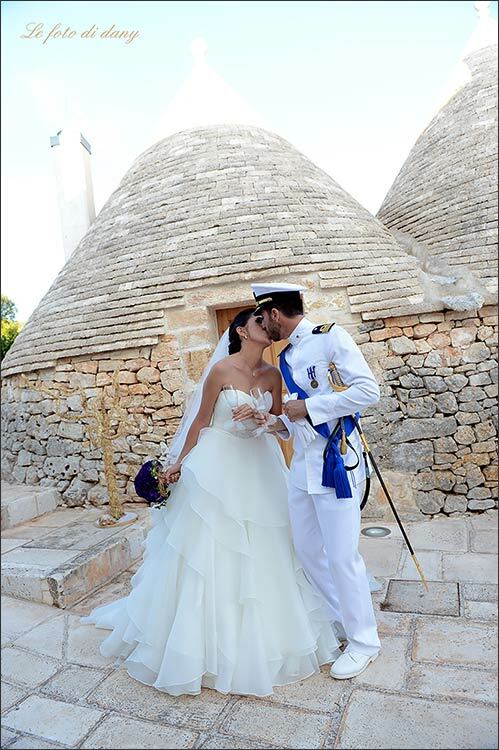 Alessia and Gianluca chose Apulia region for their country wedding. They opted for a fascinating Masseria in Murgia of Taranto. An enchanting destination far away from the city, completely fenced in stone, surrounded by Trullis – the typical conical Apulian constructions. 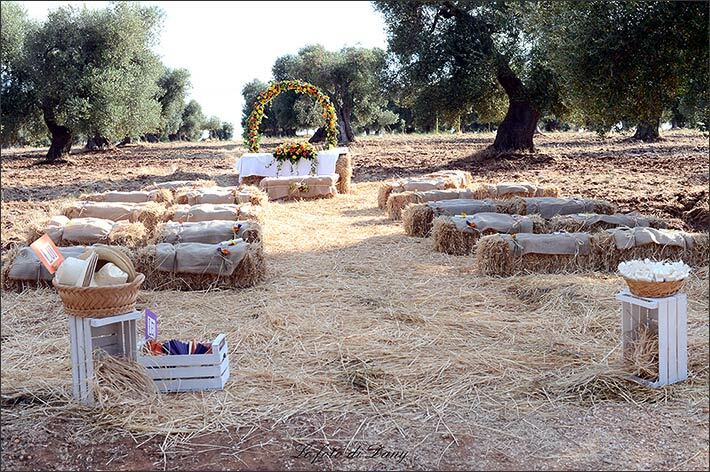 Alessia and Gianluca wanted an outdoor ceremony in the countryside and they choose an olive grove to tie the knot. 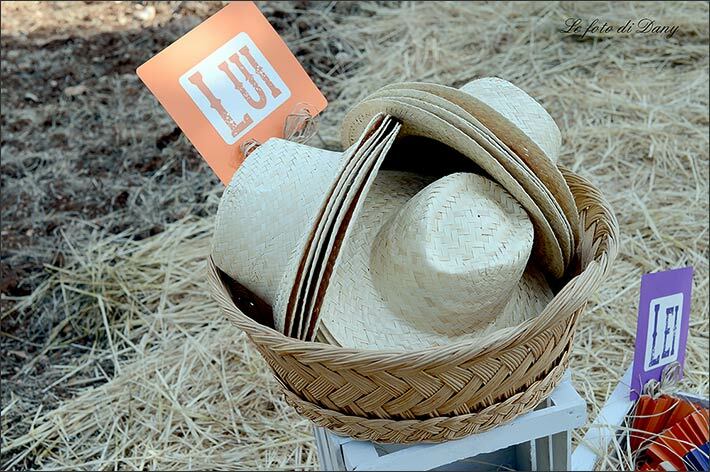 Everything respecting the nature: bales of hay as seats for the guests, simple meadow flowers in warm yellow tones, orange and violet; recycled paper fans for the ladies and staffed hats for the gentlemen. 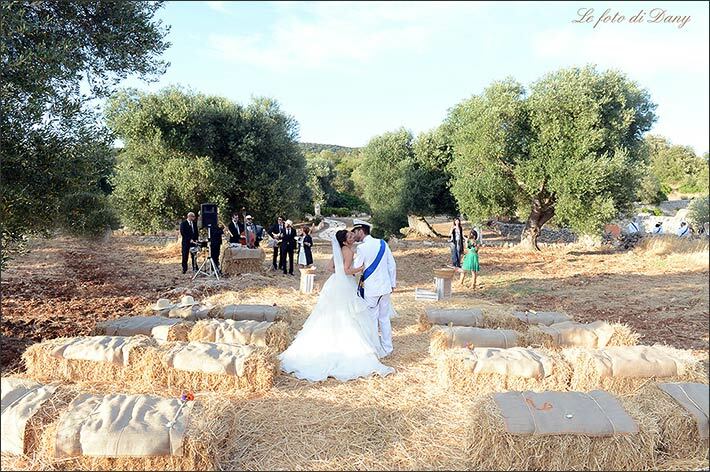 A real eco friendly, organic wedding! 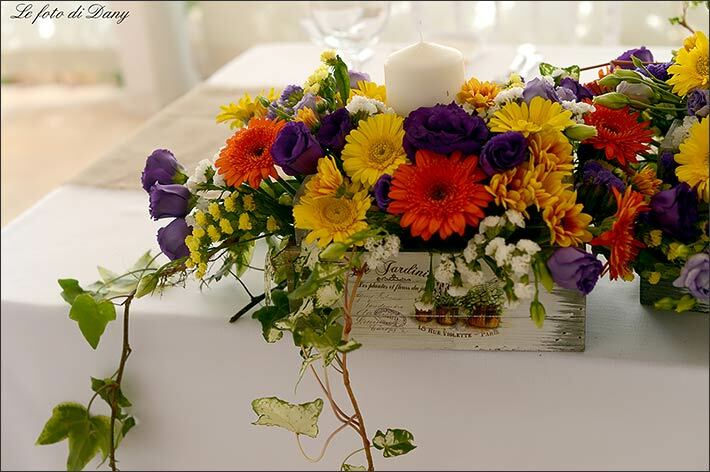 Alessia loves warm colors and she wanted them as dress code of the guests. 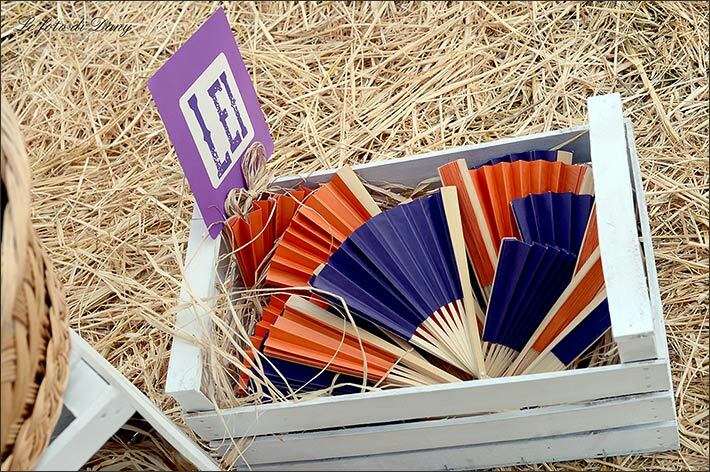 Something colorful but also happy and fun with flat shoes to be able to enjoy the country atmosphere Alessia and Gianluca wanted for all. Planners were big helper for all guests. They skillfully advised the best outfit for the day to everyone who needed help for that. The big surprise was surely the arrival of the bride! She rode a beautiful brown stallion, Alessia’s horse! 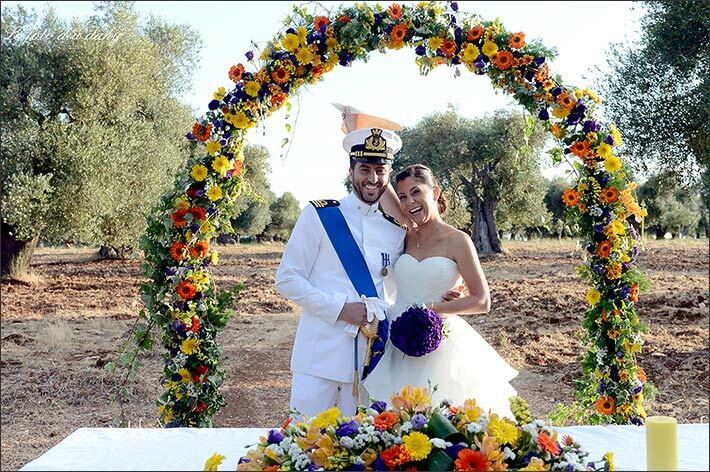 The groom, was handsome like Richard Gere in An officer and Gentleman in its Marine uniform. What a wonderful couple! 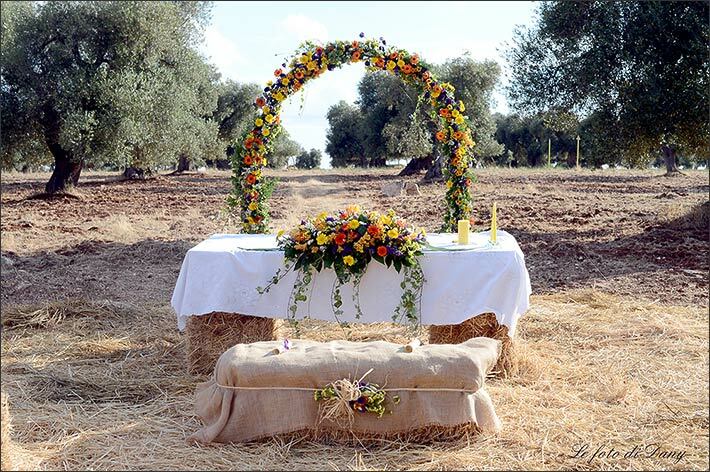 The outdoor ceremony was conducted by a family’s friend and it was really emotional. 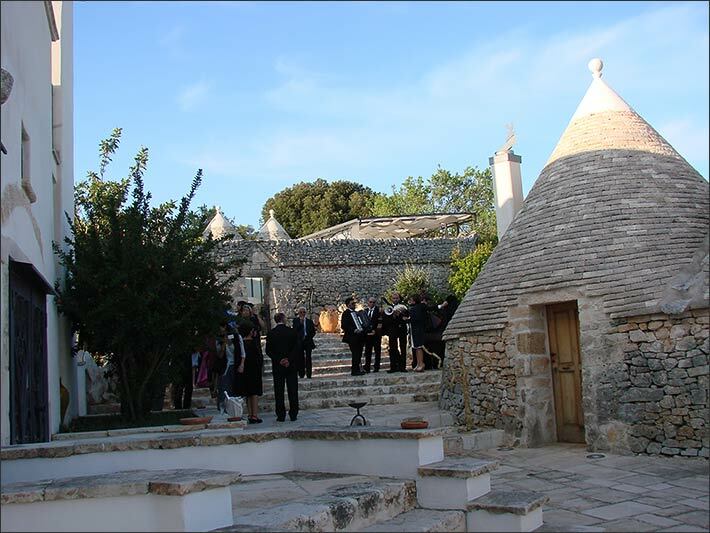 Natural surrounding and a band playing Apulia traditional music did the rest! After the ceremony Alessia and Gianluca took some time for their own for their wedding photos in the coutryside. A memory that will last forever! 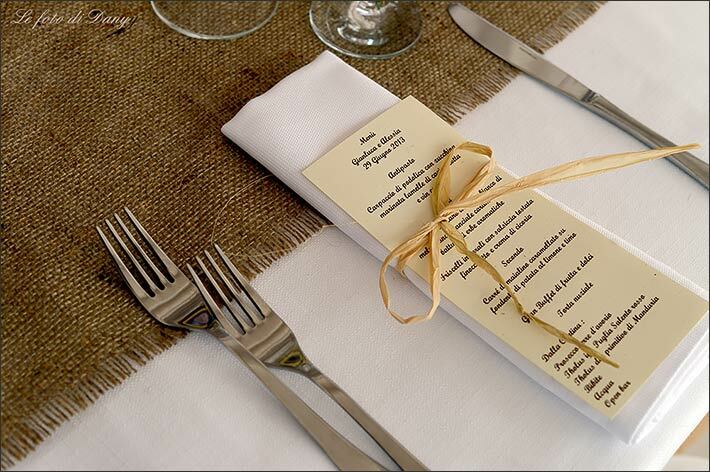 Reception featured a real homemade menu with reinterpretations of traditional gastronomic dishes made in Apulia. 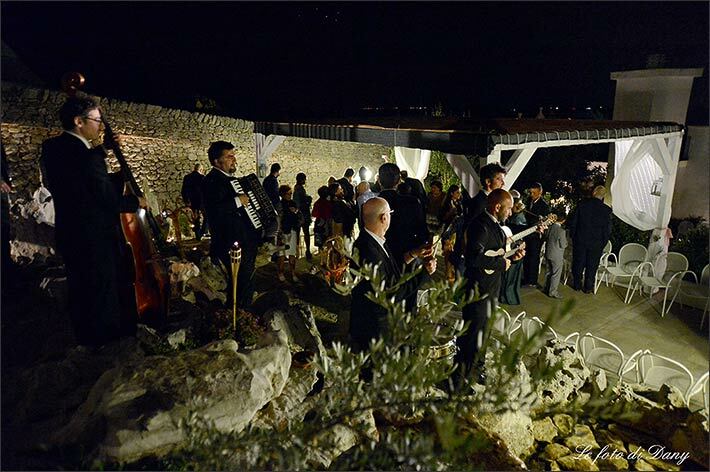 Delicious food was combined with original Apulian wines as: Primitivo di Manduria, Salice Salentino and Negroamaro. We cannot forget Apulian famous Mozzarella! This is a must! It was made in the moment and served with other traditional cold cuts and cheeses. 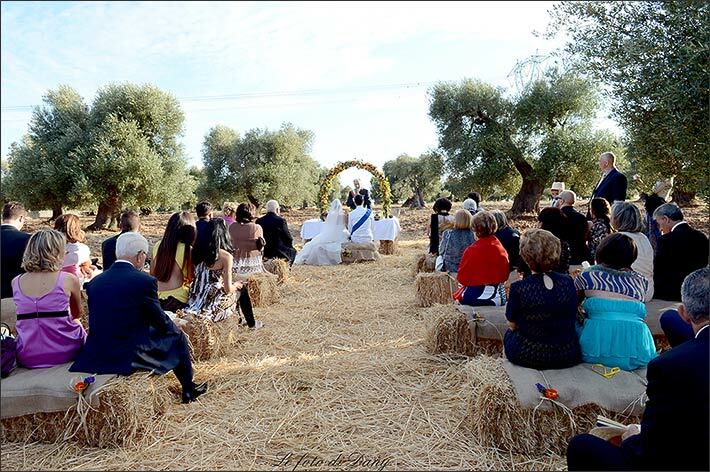 Reception areas was set just by the olive groves. Dinner was served under a huge outdoor marquee in white wood, placed in a wonderful Mediterranean style garden with aromatic plants of each kind and ancient rock cavities. Long tables for about one hoarded guests, with white linen tablecloths and jute table runners. Another organic element Alessia and Gianluca wanted for their reception. 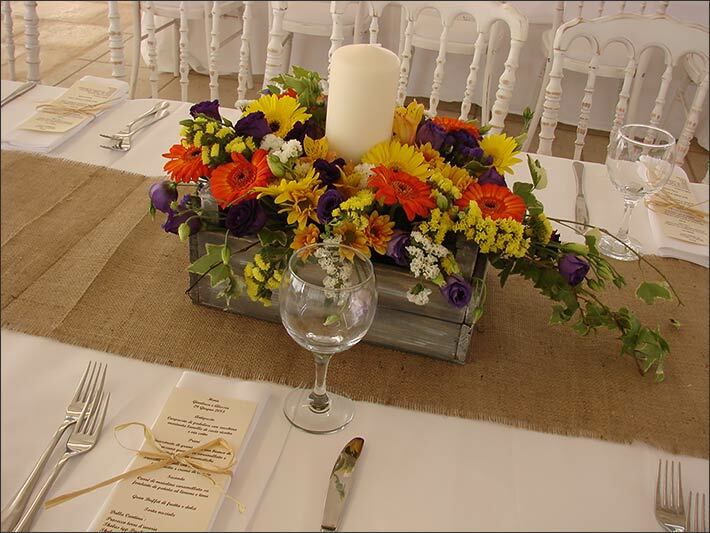 Centerpieces were made of meadow flowers in little wooden cases. It all created a wonderful organic and bucolic atmosphere. After the dinner the real party begun. 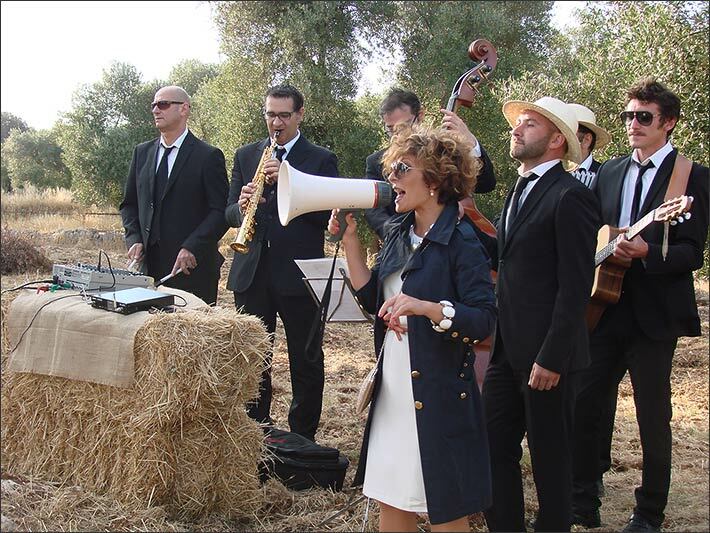 You cannot have a party in Apulia without listen and dance on famous Pizzica sound. It is the regional lively traditional Apulian music, which fitted in perfectly between one course and another. A great fun for all! 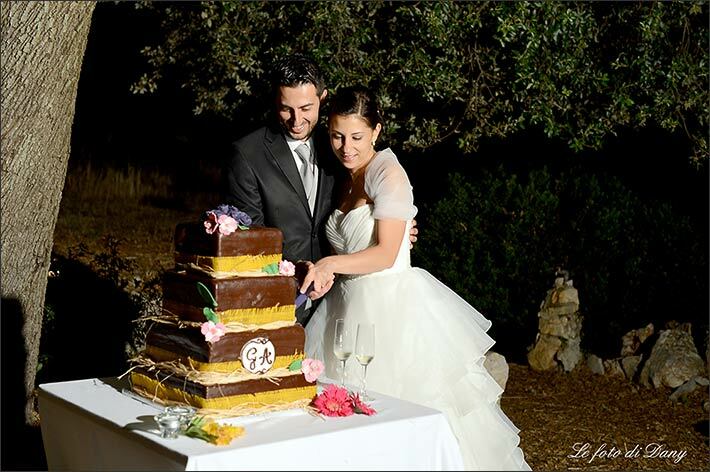 Alessia and Gianluca’s wonderful wedding cake was served between torches and lanterns. Very romantic! A very special night to tie the force of tradition with generous nature! 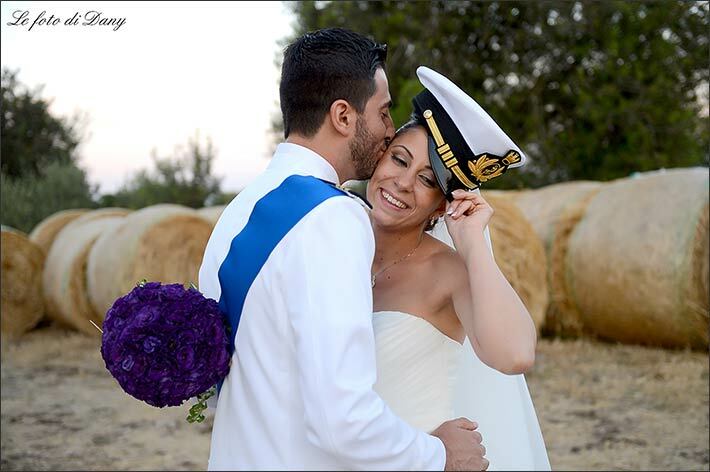 A magnificent scenario for Alessia and Gianluca, but also for their guests, who will never forget such a wonderful experience! 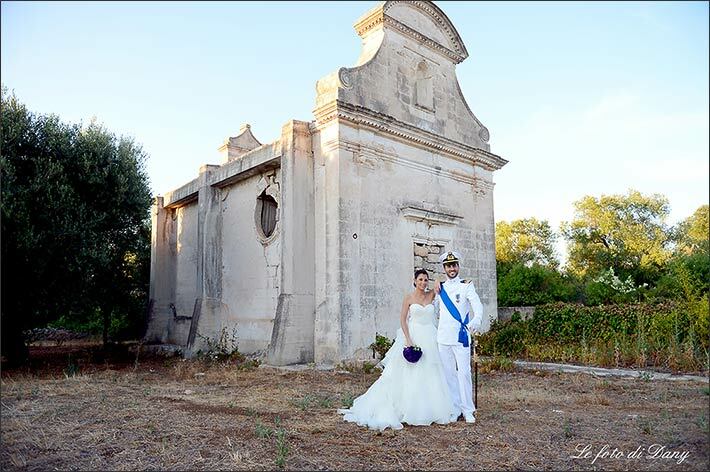 Thanks Gianluca and Alessia for showing us the beauty of Apulia region! 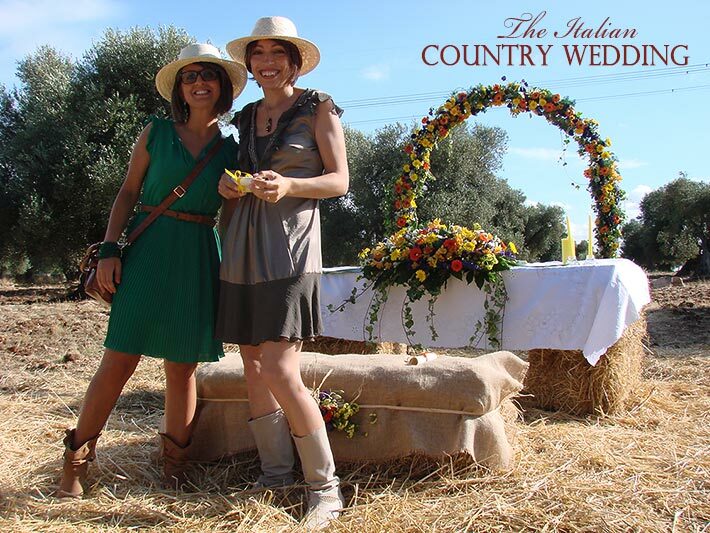 If you want to know more about a wedding in Apulia countryside please CONTACT US.